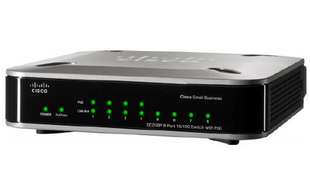 The Cisco SD208P 8-Port 10/100 Switch offers the performance and ease of use you need to get your business connected quickly and easily. Designed and priced for small businesses that want a simple network solution, the switch works right out of the box with no software to configure and features PoE to power network attached devices. You can use this switch to connect computers, printers, IP telephones, wireless access points, and servers to create a reliable network. The Cisco SD208P 8-Port 10/100 Switch is a unmanaged Ethernet switch providing wire-speed Fast Ethernet connectivity, Power over Ethernet, quality of service, and ease of use to support your business needs. The Cisco SD208P works right out of the box with no software to configure - simply plug in the Ethernet cables and power cord and the switch is ready to work. The compact size and no-fan design ensure silent operation and provide the flexibility of multiple placement options.